Members are invited to bring an unsigned, unframed work for discussion. Andrea will give tips on how to resolve issues in composition, colour harmony, and many other aspects of painting etc. Andrea Mossop has a rich balance of experience as an artist and as a teacher. Her background in art history and her passion for painting, has shaped Andrea Mossop’s reputation for depth of knowledge and breadth of imagination in teaching and lecturing. Originally from Toronto, Andrea has a B.A. from the University of Western Ontario, followed by advanced studies in drawing and painting from the Ontario College of Art. Andrea teaches intensive two-day long workshops at the OSA Orleans Campus. There will be lots of door prizes! Herb van der Staay draws his inspiration from the colours and space of the Canadian landscape. 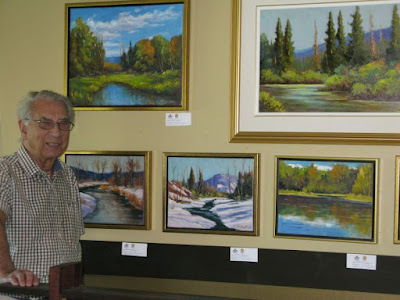 He is mainly a self-taught artist but studied under Ottawa artists Bruce Heggtveit and Robert Hyndman, and has attended workshops and painted with many fellow artists. To Herb, each painting becomes just a moment in time, the view changes constantly varying with the time of day and time of year. Herb’s work has received recognition in prizes, awards and honourable mentions over the years and his work has been on display in several local galleries. His landscapes are now on display at Luna Sole Restaurant through the month of July. Luna Sole is in the mall at the corner of Voyageur Drive and Jeanne d’Arc Boulevard in Orléans and is open daily.